Modernism meets traditional farmhouse at the this minimilist luxe Le Marche villa in the Italian countryside. This gorgeous Italian group getaway reflects the crossroads of old and new, combining into a delicate sensibility that hits the perfect note. To add to this aria of awesomeness, feed your guests perfect panacotta from down the road or day trip to the transparent waters of Monte Cornero. Le Marche is maybe one of the most hidden jewels of Italy. Thousands of rolling hills with olive groves or fruit plantations and hardly any tourists around. Le Marche Villa laid in ruins before it received a facelift by Swiss architects Wespi de Meuron — combining the best of Italy from tradition to modernity. Located on the top of the hills with a panoramic view from the landscape all the way to the adriatic coast (just a short drive away), you won’t get tired of admiring this marchigian landscape from the pool or the terrace! 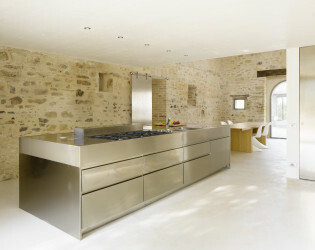 A private chef, catering, cooking classes, wine tastings etc. are available at an extra fee. 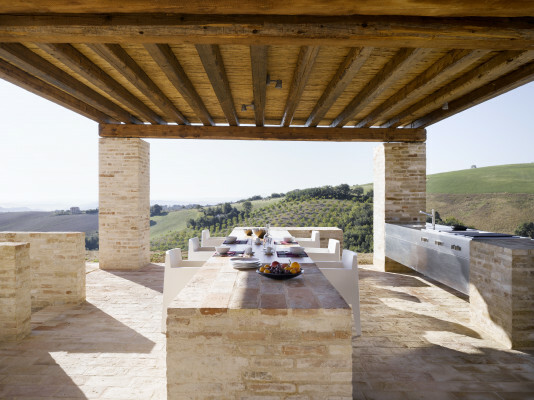 Our italian friends in Treia used to say that the house has the best position in Le Marche, on the top of the hills with a panoramic view from the landscape all the way to the adriatic coast. We spend hours admiring this marchigian landscape from the pool or the terrace! Our leitmotiv has always been to combine the best of Italy from tradition to modernity. The villa is a mix of all the talents we can find in this gorgeous country.